It’s New Year’s Day. Most of us have at least one resolution in mind to begin the new year on a better path than we ended the last year. I can think of no better person to profile on this New Year’s Day than a woman who helped thousands of people begin new lives. Today is the 125th anniversary of the birth of The Angel of Alcoholics Anonymous, Sister Mary Ignatia Gavin. Sister Ignatia was born Bridget “Delia” Gavin on January 1, 1889 in Shanvally, Turlough Parish, County Mayo, Ireland. (Click here to learn how Fiona identified Sister Ignatia’s birthplace – photos included.) She emigrated to the United States, arriving in Philadelphia on April 14, 1896 with her parents, Patrick and Barbara, and her brother, Patrick. 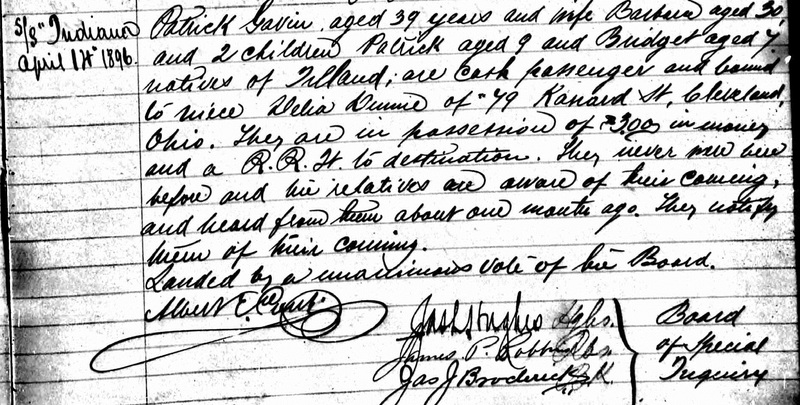 According to this entry in the “Philadelphia, Pennsylvania Immigration Records, Special Boards of Inquiry, 1893-1909” found on Ancestry.com, a niece was expecting the Gavin family in Cleveland, Ohio. Click to enlarge. Immigration Special Boards of Inquiry, Philadelphia, PA. Courtesy of ancestry.com. Above is a copy of an interesting record I came across on Ancestry.com. Immigration to the United States became more strictly regulated beginning in the early 1880s and the motives and situations of those entering the country were often scrutinized more closely than they had been in the past. I wonder why the Gavin family needed to stand before the immigration board? Perhaps they didn’t have proof of the relative in Cleveland they were joining? Was there something suspicious about the Gavins? Any ideas? Delia joined the Sisters of Charity of Saint Augustine in 1914, became Sister Mary Ignatia, and worked as a music teacher for about ten years. By the late 1920s, stress and overwork led to ulcers and Sister Ignatia suffered a nervous breakdown. Sister Ignatia’s treatment included removal from teaching and a new assignment at St. Thomas Hospital in Akron, Ohio. While working in the admissions department at St. Thomas, Sister Ignatia met a doctor who was in the midst of founding Alcoholics Anonymous. Sister Ignatia shared Dr. Bob’s passion for the necessity to provide a medical treatment program for those suffering from alcoholism. She was determined that alcoholics be admitted to the hospital through the front door like other patients and alcoholism be treated as a disease rather than a moral weakness. For more on Sister Ignatia and her role in Alcoholics Anonymous click here. Sister Ignatia was known for her practical attitude in treating alcoholism, as well as her “tough love”. She distributed Sacred Heart medals upon completion of the program, demanding their return if the recipient took a drink. She received a medal back less than 20% of the time. Father Mathew used medals of the Sacred Heart during the 1840s during his temperance crusade, as did the Irish Temperance League in the 1890s. The temperance movement was extremely important in the Irish American community throughout the nineteenth century. A tidbit of AA trivia: Sister Ignatia is responsible for the popularity of the use of coffee in the treatment of alcoholism. She was adamant that coffee be available 24 hours a day to those in recovery, building coffee bars in her Ohio treatment facilities for this purpose. The first day of 2014 is a good time to remember of something Sister Ignatia once said: “Be a better whatever you are today.” Inspirational words from an amazing Irish American. Happy New Year! Categories: What they did | Tags: AA, Fr. Mathew, Ohio, Philadelphia, Sisters of Charity of Saint Augustine, temperance | Permalink. My name is Jenny McIndoe (nee Neary) and my great, great aunty was Barbara Gavin(nee Neary) from Shanvoley. Her father was called Patrick Neary and her mother was Bridget Jordan(my great,great grandparents) and at least three of my great grandparents(John Neary and Catherine Tolan) children went to Cleveland, and would have been nieces and nephews of Barbara. My grandfather John Neary and his wife Bridget were the only ones from John and Catherine’s offspring to stay in Ireland. Also my Father Peter’s(George on paper) sister who was called Bridget, was always called Delia by everyone. Our cousin still has a farm in Shanvoley next to the old place. I only found out about sister Ignatia whilst going through my family tree with my sister Ann a few days ago and so decided to see if i could find any info on her, so that’s how I found this, and I must say I am truly in awe of her and all her work, she truly is an angel. I hope this information is helpful and we do have most of the names of Barbara’s brothers and sisters if you need them, so don’t hesitate to get in touch if you would like to know more. Thank you so much for getting in touch! I, too, only recently learned about Sister Ignatia (she was mentioned on a TV program) and was immediately intrigued. She is indeed an amazing woman. 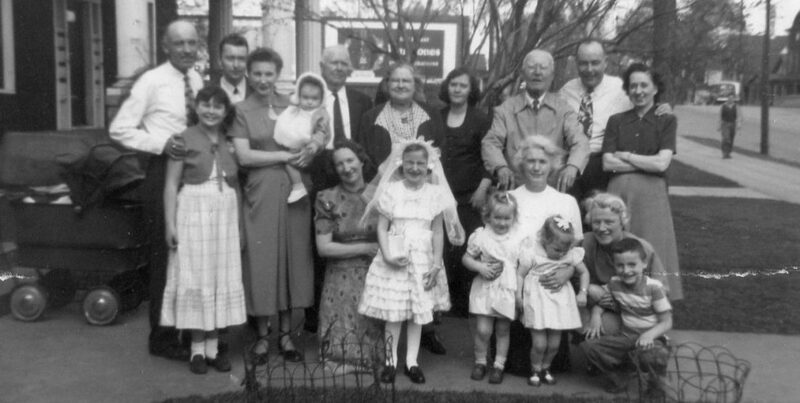 Do you know what became of all of your Neary relatives in the US? I would be interested in learning more about Delia’s early days in Cleveland. Do you still live in Ireland? Feel free to email me directly: aine@archival-solutions.com. Thanks again for the comment. It was great hearing from you!